These three works were the prizewinners in the First International Composers' Competition 'In Memoriam Zoltán Kodály'. The recordings all emanate from the winners' concert and have applause and a modicum of audience noise. The Gulya piece is quite attractive without being altogether original: more, in the outer movements, a meeting of hearts and imaginations between Kodály (Peacock and Galantá), Ravel (the two piano concertos especially the G minor), Gershwin (Concerto and Rhapsody) and Shostakovich (Second Piano Concerto). The middle movement is typically pensive; almost a pastiche, at times, of 1960s French film music. The Knell work is tougher pabulum with the element of dissonance noticeable but hardly belligerent. A substantial concert piece it is essentially idyllic but is challengingly troubled by an evocation of furnace heat and intensity. I thought of Delius and Penderecki. 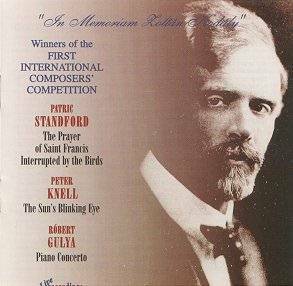 Standford is a much better known composer than Gulya or Knell. (see composer profile). His is perhaps the thorniest piece on the disc. It is allocated four tracks, the first of which suggests a slowly turning maelstrom of chaos impelled by drums and tam-tam. From this surfaces a nervous idyll from which strikes out and upwards abrasive trumpets. From this avant-garde introduction rears up a typically English choral paean. It is ruffled by atonal birdsong but the vocal writing remains obstinately and admirably Howellsian or, towards the end, Holstian in the manner of Hymn of Jesus. No 'violence' is required of the choir. The magnificent surging complexity of the singing reminded me a little of the glories of Havergal Brian's Gothic Symphony especially the Te Deum. You may also fairly imagine Allegri's Miserere and Tallis's Spem in Alium as an 'aural image'. The orchestra remains rooted in the argot of modernity with string glissandi, pattering and argumentative percussion, mordant violins (as in Panufnik Tragic Overture) and malevolent brass. The presence of a cimbalom (even though contributing within a framework of modernity) inevitably suggests a linkage with Kodaly's Hary Janos. On the basis of hearing this piece three times I did not feel that the juxtaposition of two elements: a fairly avant-garde orchestral canvas and a warm tonal choral overlay, was completely resolved. Anything by Patric Standford is well worth your attention. If you have modestly tense sinews then you will find much to appreciate in this piece. I for one hope that it will be a pathfinder for recordings of his Cello Concerto (premiered by Raphael Wallfisch) and Symphony No. 5. An intriguing collection. Gulya: instant access; Knell: a thorny tone poem but easy if you persist a little; Standford: challenging, forbidding orchestral exterior - accessible choral writing.